providing comprehensive medical, surgical and dental care. care throughout the life of your pet. wish to help those in need. we have a special spot for kittens in need of a loving home. Here at Victoria Road Animal Hospital we wish to help those in need. Currently, in partnership with the Guelph Humane Society, we have a special spot for kittens in need of a loving home. 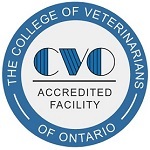 At Victoria Road Animal Hospital we strive to offer not only sound advice, but also optimal veterinary care, thus allowing you the enjoyment of your companion for a maximum number of years. Our goal is to practice the highest quality medicine and surgery with compassion and an emphasis on preventive medicine and education. Our entire healthcare team is committed to providing personal attention to the unique concerns of each individual pet owner.